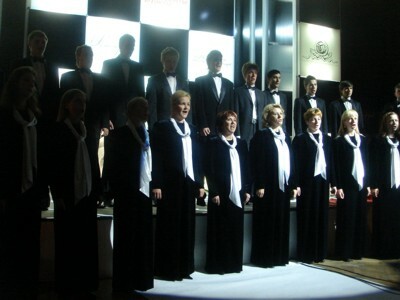 The greatest exhibition worldwide that ever took place was to be seen from september 16th until september 21st 2008 in St. Petersburg (Russia). To participants from Russia, Belarus, Ukraine, China, Japan, Taiwan, India, Israel, Jordania, Armenia, Persia, Syria, Tatarstan, South Amerika, Australia, the US of America, Turkey, Iceland, Finland, Norway, Belgium, the Netherlands, Italy, France, and Germany was given a marvellous place to present their work to a large public. During six days the exhibition was visited by around 25 thousand visitors, some of them had a long journey to see that big cultural event. 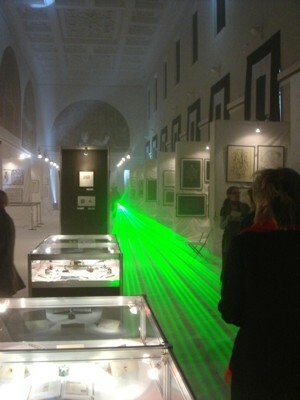 A light- and lasershow and classical music was set up during that phantastically designed exhibition. 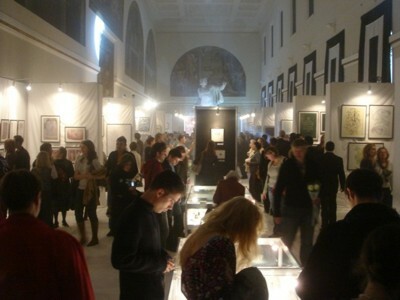 In one of the two large halls of the "Repin St. Petersburg State Academic Institute of Painting, Sculpture and Architecture" from the Renaissance period with paintings and sculptures from this epoch the russian and latin Art of the Letter was presented, in the other hall the hebrew, east asiatic, indian and russian Calligraphy. 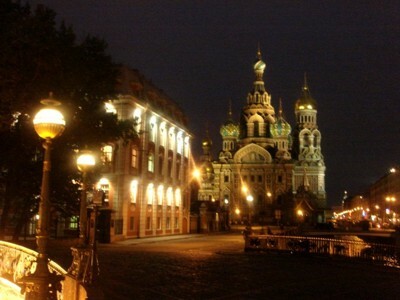 The entire first floor of the "Repin St. Petersburg State Academic Institute of Painting, Sculpture and Architecture"
around the clock, made interviews with the organizers and the participants as well as life broadcasts. 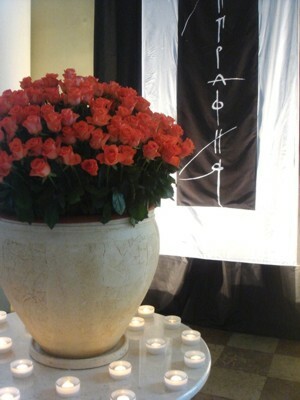 Gigantic bunches of roses decorated the entrance of the exhibition, and two electronic pianos played automatically classical music. 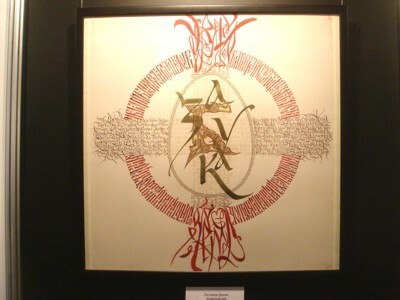 In the exhibition were not only shown works from over 60 participants, but also a large overview of writing tools, literature about calligraphy, letters applicated on plates or on tiles as well as in metal, and also artist books or historical documents of the Russian or Byzantine culture were presented. Among the texts an original letter by Catherine the Great was found. 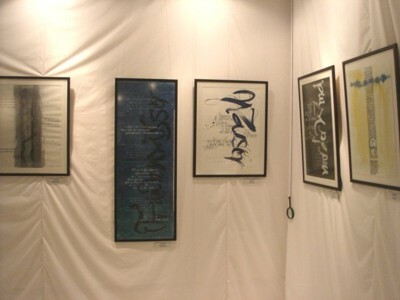 In addition to the exhibition program an exhibition of student works and a calligraphy competition for children was organized. 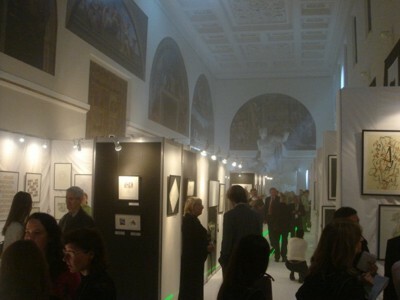 Each day the exhibition halls were crowded like on these pictures. 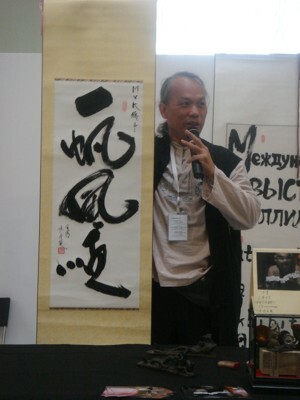 scroll he calligraphed for his 70th birthday he will celebrate this year. 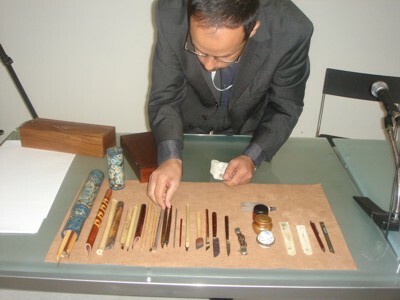 arabic calligraphy tradition and the preparing of the arabic writing tools. 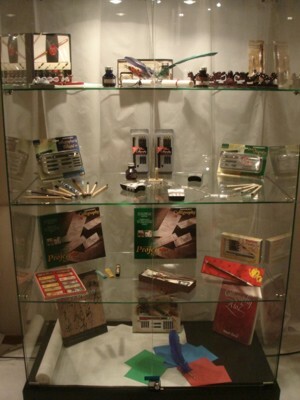 and leads a museum of miniature painting in Taiwan. Ganzorig Aleyksander from Ulan Bator (Mongolia) und Katharina Pieper standing in front of the powerful work of Ganzorig. 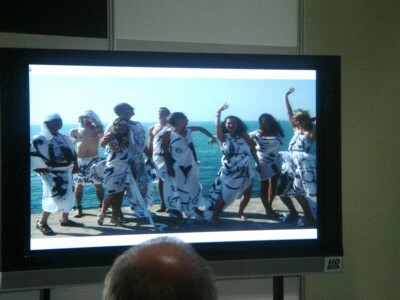 the participants were shown many cultural highlights of the city. 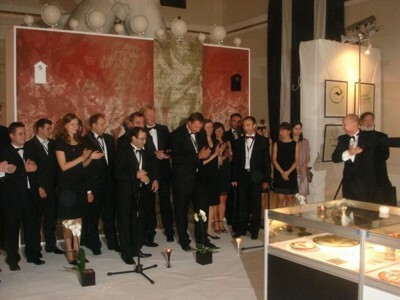 presented themselves, and specially the leader of the project, Mr. Alexej Shaburov was celebrated. by Andrea and Volker Wunderlich from Bayreuth (Germany). A real focus point for the public! and school classes as well as visitors of all kind of people were hightly interested in the works. 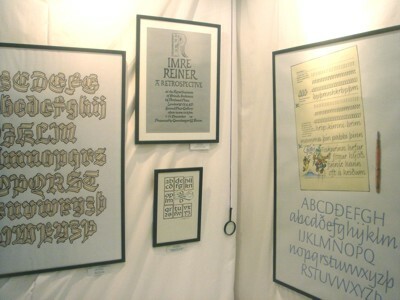 like here on the right side for the fine Copperplate work of Jean Larcher (Paris). 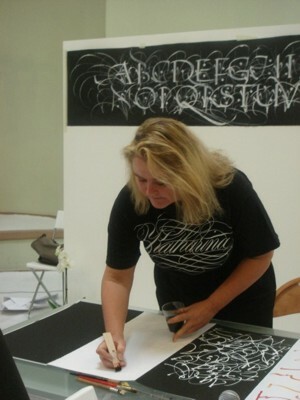 On the left picture and left on the right one you see the works of Katharina Pieper. 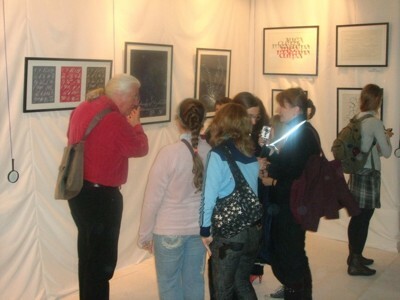 Jean Larcher is explaining his work to young visitors. 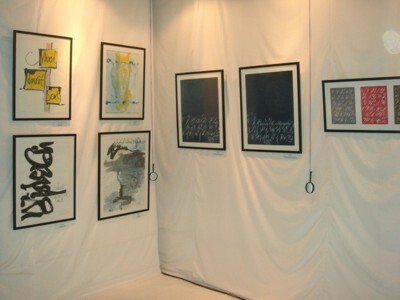 On the right wall you see a part of the work of Prof. Werner Schneider. 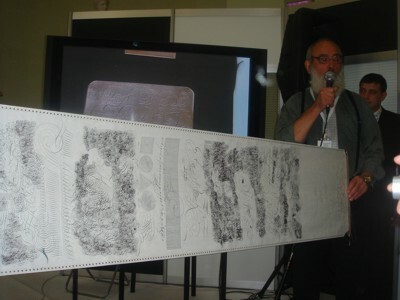 Achyut Palav from Bombay was demonstrating a large scroll in front of the public - an excellent expressive work. 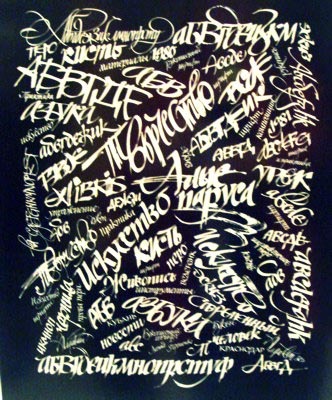 indian culture of calligraphy. Achyut and Katharina are friends since 22 years. and the interested public could see very different methods of presentation. she was doing a performance "by four hands" on a concertina book ("leporello"). On the right side you see a work of Leonid Pronenko (Krasnodar, Russia). 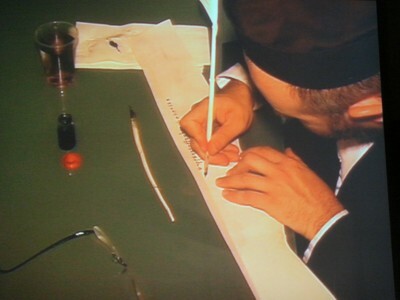 an extremely high level by the help of the computer, not only in his work he exhibited but also in a very well done lecture. 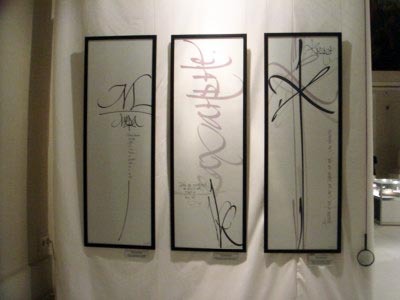 On the right side you see a work of Olga Varlamova, student of Prof. Petr Chobitko (St. Petersburg). 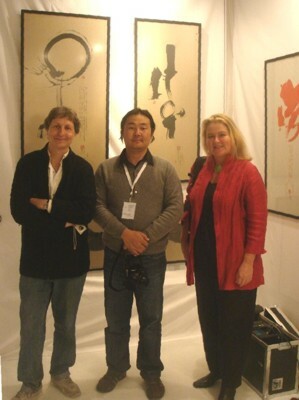 was exhibiting expressive works in large size. when done on a fabric during archaeological studies!